From what to wear, to finding a reputable instructor, there’s a lot to think about when you want to learn about horseback riding. Written by Jayne Pedigo for EquiSearch. Once you have decided that you want to learn horseback riding, there a number of things to think about, from whether you want to ride English or Western, to what to wear. 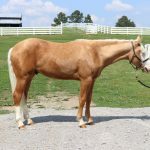 Depending on where you live, you may have a wide variety of riding stables to choose from, or a very limited selection. You can find them by scanning the notice boards at local tack and feed stores, browsing local equestrian newspapers or even searching on the Internet. Some stables concentrate on either English or western lessons and some have trainers that can teach both. The discipline you choose will depend on a) what’s available in your area and b) what your own aspirations are. Regardless of discipline, standards of teaching vary considerably and your main concern should be safety of both rider and horse. Talk to pupils at the stables you are considering. Ask them about the horses, the instructors and the level of instruction. If any of their answers bother you, then you would be advised to select another facility. Instructors who have been certified by the American Riding Instructors Association have demonstrated their teaching ability and have reached a level of competence that will help provide a safe learning environment to their pupils. The ARIA maintains a list of certified instructors. Riders in the UK can select from the many excellent establishments approved by the Association of British Riding Schools. Riding clothing, especially English riding clothing, has evolved for comfort and safety. Breeches or jodphurs are stretchy, allowing you to lift your leg up to the stirrup without cutting into you behind the knee. They often have knee patches of suede, or faux-suede. These give you a little added security in the saddle, while at the same time giving your leg some protection from getting pinched in the stippup leathers. Riding boots protect the lower leg and support the ankle. While it’s not necessary to run out and buy expensive riding habit before your first lesson, you will certainly be more comfortable if you wear suitable clothing. Shorts are a definite no-no. Whether you ride English or western, after an hour in the saddle your inside leg will be rubbed raw without the protection of long pants of some sort. Jeans are best, as an alternative to breeches. If you’ve got stretch jeans, preferably without a seam on the inside leg, you’re in great shape for your first horseback ride. On your feet, you’ll want shoes with a good shank to give your feet support in the stirrups. A small heel will lessen the chance that your foot will slip all the way through the stirrup. Sandals are definitely out, since as well as giving no support, they don’t protect your vulnerable toes from getting stepped on before you mount. Sneakers are not really a good choice either, since they don’t offer the arch support you’ll need, however there are many selections of “riding sneaker” that offer the correct support and can also be used as everyday wear. Western boots are also a suitable choice for your first horseback ride. I’d like to see every rider wear an approved safety helmet every time they ride. But that’s just my opinion and the helmet/no-helmet debate rages daily so I won’t get into it here. Generally, you’ll find that if you’re learning to ride english, you’ll be expected to wear a safety helmet. Many instructors and lesson barns have helmets available for beginners to use, but if you’re planning on a course of lessons consider buying a well-fitting helmet of your own. It’s less common to see western riders wearing safety helmets, but increasing numbers of riders are starting to see the light. Generally they wear the same safety helmets as English riders, but there are also special helmets available which fit under western hats. 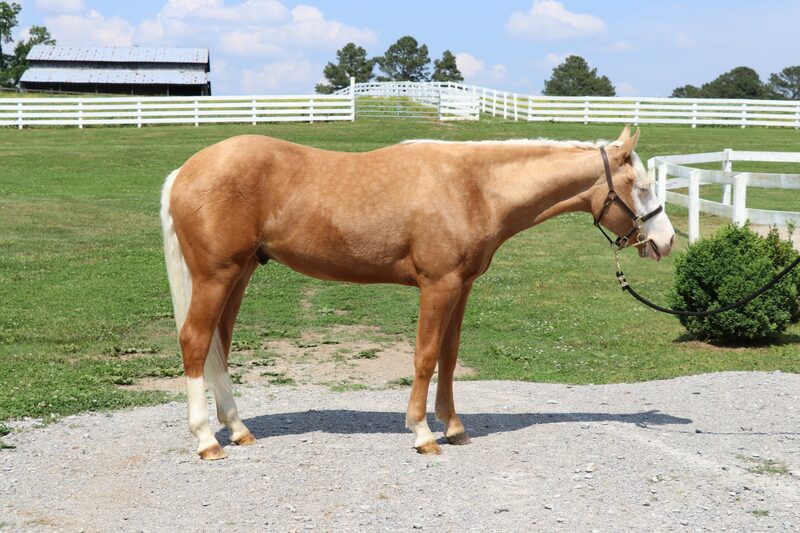 Horses can be unpredictable animals and safety should be an important part of any lesson program and in your future life with and around horses. Our Safety page contains a number of articles about safety, including how to work safely around horses and safety helmet testing procedures. 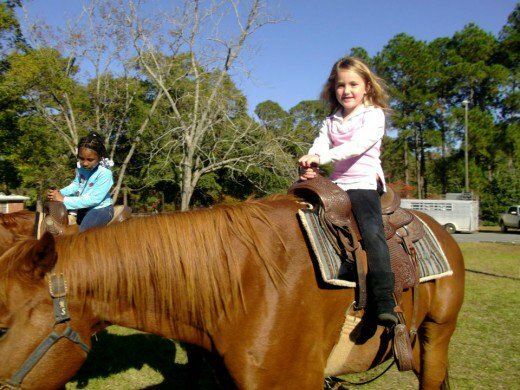 If you are a parent whose child wants to learn to ride, my article entitled A Child’s Safe Start to Horseback Riding is full of advice and information on how to make sure your child’s introduction to horses and riding is a safe one. Don’t be surprised if much of your first lesson is spent on the ground. 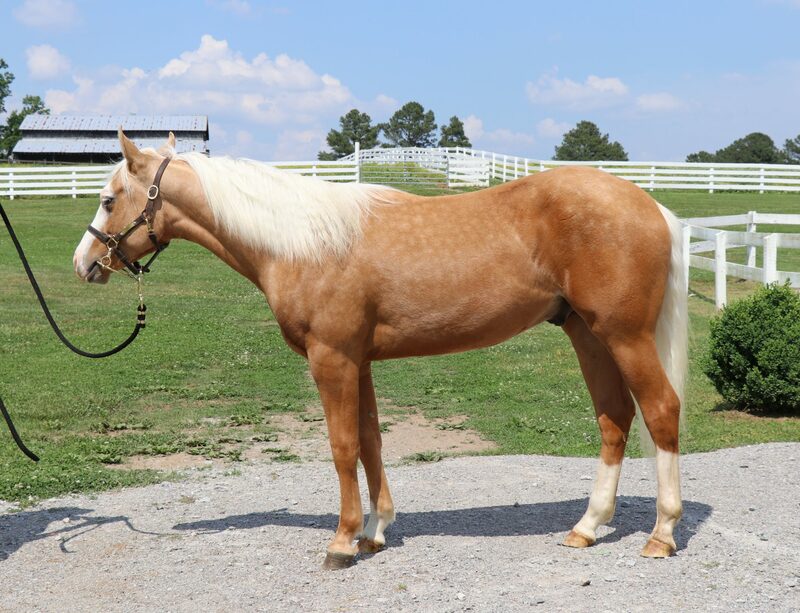 As mentioned above, horse can be unpredictable animals and a good instructor will spend time teaching you about the correct handling of horses, before allowing you to get on. You’ll learn about haltering and leading, grooming and tacking up etc. Some people might think this is a waste of money – they are eager to get mounted and get riding. 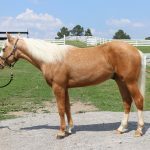 However, this is all part of horsemanship and the more competent you are around horses, the better relationship you will have with them going forward. Your early lessons will be geared towards giving you the skills you need to become a good rider. You’ll learn the correct way to mount, the correct position, the aids which you will use to communicate with the horse, etc. Many instructors like to give early lessons on the lunge. This is where the horse circles around the instructor on an extra long lead line, called a lunging rein, or longing rein. This gives the instructor control of the horse and allows you, the rider, to concentrate on learning about balance and co-ordination without having to worry about controlling the horse. 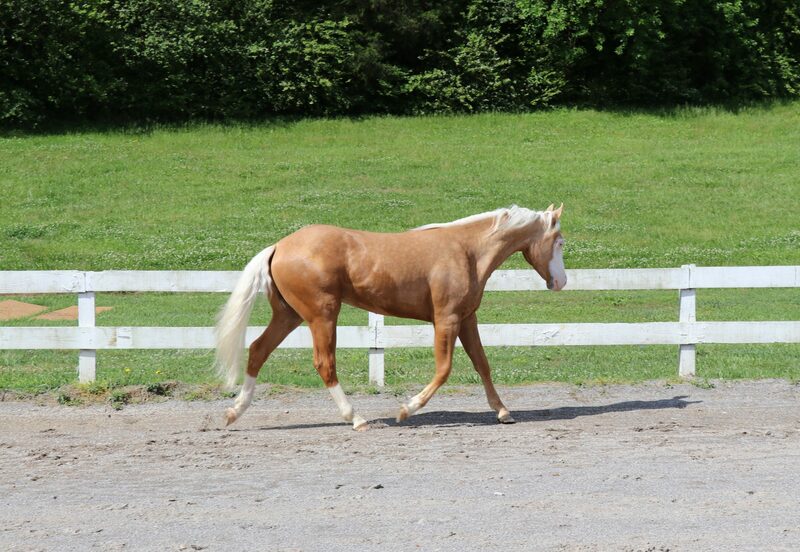 The lunge-rein is especially helpful when you’re trotting for the first time. Sometimes horseback riding can seem very complicated and it’s much easier if you only have to think about one thing at a time, until it all becomes second nature. Your lesson program will be progessive, with each lesson building on skills learned in previous lessons. A good instructor will challenge you, without “overfacing” you or getting you doing something you’re not ready for. At any time during your lessons you should feel comfortable telling your instructor if you think she’s moving too fast for you. Designed as a companion guide to a weekly lesson program, this book will complement and reinforce the ideas and techniques introduced by your instructor. The Trish Franks School of Riding, LLC has been offering quality instruction in hunt seat, reining, horsemanship and dressage since 1992. We have lesson horses and ponies all types of students (young and old). 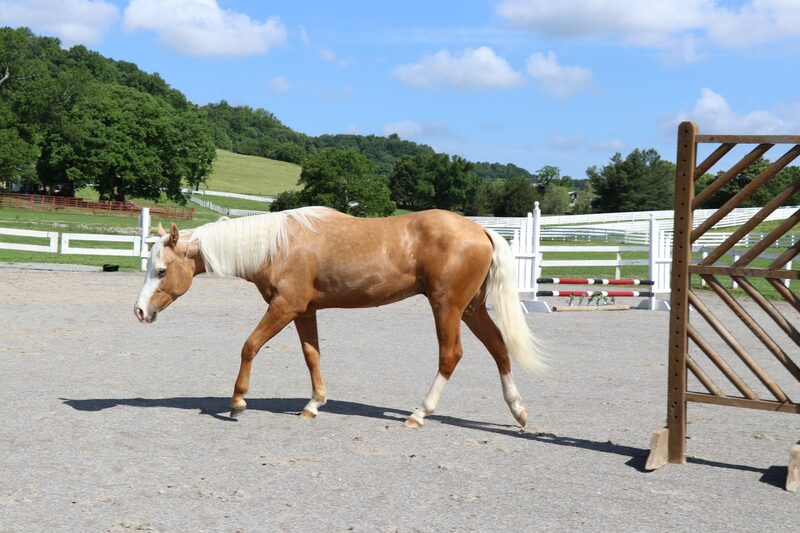 This is the most well known and liked Riding School Program In Middle Tennessee, I also have requested that to others take your child to this program for the betterment of their riding skills.. Yes, I Want To Sign Up.